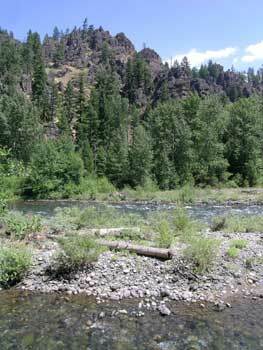 Near the mouth of Lost Creek, located southwest of Cliffdell along State Route 410, stands a monolith of great jagged rock which catches the eye of passerbys. Like most monuments, their names came from some prominent figure in history associated with its discovery or special event that took place on or near it. Edgar Rock is no exception as it got its name from a well known pioneer, trader, scout and all around outdoorsman, John Edgar. On June 10, 1853 twenty men left Fort Steilacoom on the west side of the Cascades to clear the Naches Pass Road to the summit. John Edgar, a scout for the construction crew, went ahead to the Yakima Valley to scope out the proposed new road. With little money and the coming of winter the road was never completed to the extent it could be easily traveled. As time passed hostilities broke out with the Indians and the military increased its use of the Naches Pass Road. On October 5, 1855 Captain G.O. Haller, and his men who were from the Dalles, Oregon, encountered a large group of Indians on Toppenish Creek south of the Yakima Valley and a confrontation took place. Greatly outnumbered, Haller and his men made a hasty retreat back to the Dalles, but not before suffering eight dead and seventeen wounded. As Haller was engaging the Indians at Toppenish Creek, Lieutenant Slaughter had been sent across Naches Pass from Fort Steilacoom with forty men to join Haller. While encamped at Spring Flat above Cliffdell, John Edgar, Lt. Slaughter's scout, was down the Naches Valley about a mile from camp when he ran across two Indian scouts. Edgar, being wise to the ways of the Indians and knowing one of them, Old Teias, who was his wife's uncle, fell into conversation with them. Pretending to warn them of Slaughter's approach, Teias came back with news of Haller's defeat and retreat. Teias also made it known to Edgar the force that had defeated Haller was now camped near the Nile and their intent was to locate and wipe out Slaughter. Knowing this, Edgar wasted no time in bidding his uncle farewell and headed back to Slaughter's camp to recall Slaughter and his troops. Because of this meeting between John Edgar and the Indians along the river just below Cliffdell and in the shadows of this great rock, it was named Edgar Rock. "Within half a mile (Spring Flat) we came to a remarkable rock or rather precipice, called "Edgar Rock" from Mr. John Edgar, who was killed at South Prairie last winter (shot by Indians), who always used this route when trading with the Indians. The trail went up one side of this rock to the summit and passing some distance over, came down on the other. It was difficult for a man to get up, but by this time, the whole train (175 officers and men, plus 26 packers and 82 pack animals, and about 20 cattle) had to pass. It did so fortunately without accident, but it took almost a day." Edgar Rock stands today as a warranted monument to one of the first pioneers in the west. Easily recognized from State Route 410, Edgar Rock proves to be a trying yet worthwhile hike to an awe inspiring view of the surrounding country. From 1933 to 1951 this same view provided the Forest Service an ideal location for a fire watch. Cement footing at the top is only record remaining of a time when vistas were used by the Forest Service to construct lookouts. Today these same footings provide the haggard hiker with a comfortable resting place to look out across the forest landscape and ponder the past and those people who made this all possible. 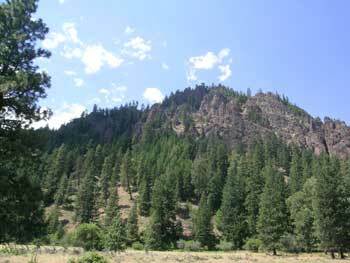 Hikes to the peak of Edgar Rock can be made from Lost Creek Trail #964 (3.2 miles) and Edgar Rock Trail #964A (0.3 mile). For Lost Creek Trail, turn left at the T in the road, following the signs to Lost Creek Village Camp. 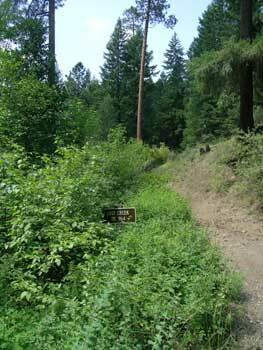 You will see the trailhead on your right, approximately .5 to 1 mile before Lost Creek Village, on the right of a sharp hairpin curve off of Lost Creek Road FS #1704. “The USDA is an equal opportunity provider and employer”.